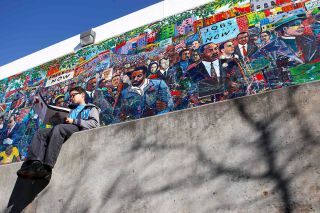 A ten-year-old sits reading in front of a mural showing the life of Martin Luther King, Jr. in Atlanta, Georgia. Carie Lemack is co-founder and CEO of DreamUp, the first company to bring space into classrooms and classrooms into space. A former national security policy expert and advocate and producer of an Academy Award-nominated film, Lemack is a proud alumna of Space Camp and supporter of all space cadets reaching for the stars. Lemack contributed this article to Space.com's Expert Voices: Op-Ed & Insights. Martin Luther King Jr. Day is a reminder of what King called "the fierce urgency of now," of the need to act quickly and decisively for the good of an inclusive America. It also serves as a summons from a minister whose heavenly mission speaks to our urge to explore the heavens. King's words are still relevant today, and they will always be relevant to matters of justice and peace. However, he very rarely spoke publicly about space, save his Nobel Peace Prize acceptance speech, where he contrasted the astonishing peaks of science and the unfathomable ranges of interstellar space with the earthly realities of poverty and racism. King's speeches are replete with references to the triumphs of black professionals, from doctors and lawyers to engineers and entertainers, and from writers and teachers to reporters and legislators. But somehow, despite the overlap between when the civil rights movement occurred and the commencement of the space race, despite the launch of Sputnik and the rise of NASA during King's time, despite President John F. Kennedy's pledge to land a man on the moon and return him safely to the Earth, despite the nation's passion for those men with the right stuff — despite all of these things, and in spite of the lack of color among the Mercury, Gemini and Apollo crews, King was silent about a subject of such scientific achievement and political ambition. This is not a criticism of King, but rather a call to further his dream and advance the cause of freedom in a realm he didn't often discuss. Although there are and have been African-American astronauts (both men and women), as well as Muslim and Jewish astronauts, we can do more to encourage minority involvement in space-based research. And we must do more, because we cannot explore the diversity of space without a diversity of explorers. Recruiting these men and women is no act of tokenism; we need the best Americans, regardless of race or gender, to maximize the best of America. These citizens are students at our colleges and universities, pupils at our primary and secondary schools, and our dreamers — and doers — throughout this country of 300 million people. Now is the time to introduce these individuals to the power of space-based research, continuing King's work. This is not the work of a single day or of a single person, or even of a single generation. But today — Martin Luther King Jr. Day — is a singular day honoring a singular leader. It is a day to seize the moment. Let us, therefore, do our duty and ensure that the cause endures, the hope lives on and the dream shall never die.